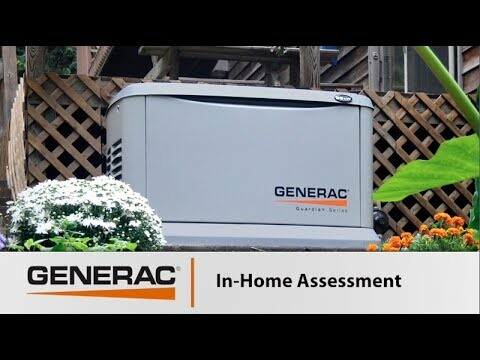 A free in-home assessment from a Generac professional will help you find the best home generator for your backup power needs. But what should you expect at the assessment? With the help of Danny Lipford, this video takes you through the entire process. How Does a Generac Home Backup Generator Help Me? Former CIA director James Woolsey explains the threat of cyber terrorism on the U.S. Electrical grid. Lou T. of Wisconsin invested in a Generac automatic standby generator to have the peace of mind knowing that he and his home were protected from power outage. Lori lives in rural Illinois, and frequently lost power when it stormed. When she loses power, she does not have access to clean water, which is an issue when you live on a 15 acre farm with horses. Learn more about why Lori invested in a Generac automatic standby generator. After Hurricane Sandy, Jimmy M. explains why he invested in a Generac automatic standby generator. Greg and Ellen of Pennsylvania explain why they invested in a Generac automatic standby generator. Mobile Link cellular remote monitoring lets you access important information such as current operating status, maintenance schedule, historical information, and more directly from your smartphone, tablet, or computer. The first variable-speed home standby generator, the Generac Synergy varies its speed based upon electrical load, for quieter operation, improved fuel-effeciency, and exceptionally clean power output. The Smart Management Modules are wire-free, which makes them easier to install since no control wires are required, and helps lower installation costs. Up to eight Smart Management Modules can be installed with a compatible automatic transfer switch to manage power loads. The 22 kW Guardian® Series home standby generator is the largest air-cooled home standby generator on the market and boasts the lowest cost per kilowatt of any air-cooled home standby generator. Thanks to Quiet-Test, Generac's new 22kW Guardian Series automatic home backup generator runs its self-test at a lower, quieter RPM than standard operation, and can be programmed to run weekly, bi-weekly, or monthly.